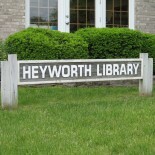 Patrons with valid library cards from Heyworth Public Library and many area libraries may borrow from our collection of materials. *Borrowing privileges are suspended when the amount owed reaches or exceeds $5.00 in fines or fees. What is the overdue fine? *Materials are considered lost if they are not returned within 30 days of the due date. Your account will be charged for the original cost of the item plus a $5.00 processing fee to cover shipping and administrative costs. Most items can be renewed one time if no one is waiting on it. You may renew in person, by phone at (309)473-2313, by text, with the Bookmyne App, or online. To renew items in person, please have the item, your library card, or photo ID with you. To renew by phone, please have your library card number ready. Select Renew Items Online under My Account on this site. If you need don’t remember your PIN, select Forgot my PIN to change it. Fill in the checkbox next to the individual title(s) you would like to renew, or the Select All box at the top of the list. Why can’t I renew my item online? The item is on hold for someone else. You have a fine of $5.00 or more. If you have any questions, please call the library at (309)473-2313.